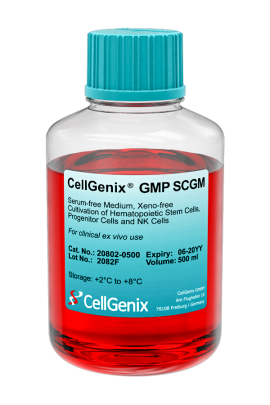 CellGenix GMP SCGM is an optimized, xeno-free medium used for the serum-free expansion of low numbers of isolated human hematopoietic stem and progenitor cells (HSCs/CD34+ cells). In addition, our SCGM is proved to be highly efficient for the expansion and cultivation of human natural killer cells (NK cells) and human cytokine induced killer cells (CIK cells). 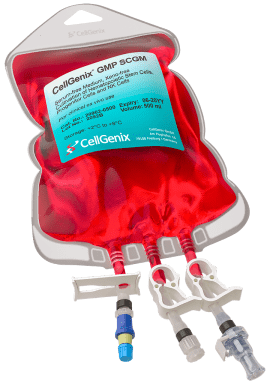 CellGenix GMP SCGM is widely used for standardized generation of autologous and allogeneic cell therapies using HSCs, NK cells or CIK cells. We offer the cytokines and growth-factors needed for optimal growth of one of these cell types separately. This provides you the freedom to customize and create your own optimal cytokine mixture. To fit different cell and gene therapy manufacturing processes, we conveniently offer our media in both bags and in bottles. 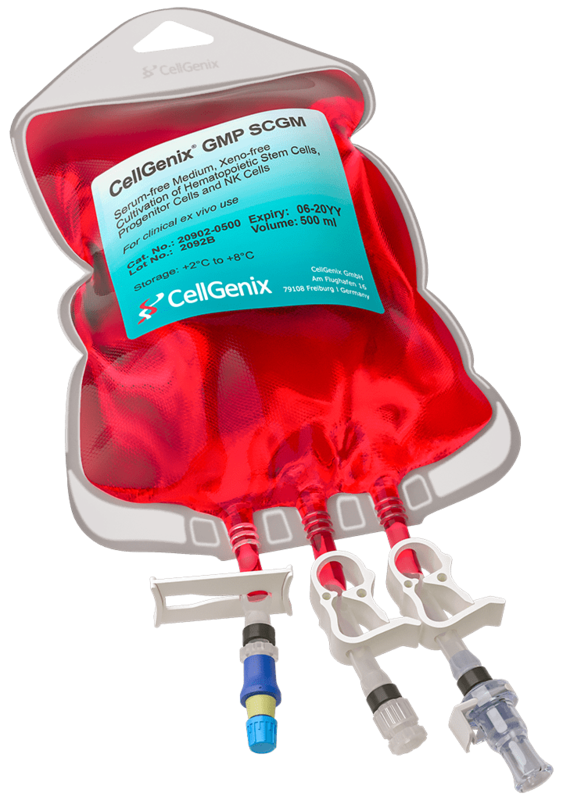 CellGenix GMP SCGM is produced following all applicable GMP guidelines and allows for the safe use in accordance with USP Chapter <1043>. Our GMP Media include documented evidence of lot specific sterility, activity and stability. In combination with our expert regulatory and technical support this will help simplify your raw material qualification and validation efforts. 7.2 – 7.5, determined according to Ph. Eur. ≤ 1 EU/ml, determined according to Ph. Eur. For clinical ex vivo use. Not intended for human in vivo application.